This charming 1918 Bungalow is in great shape. 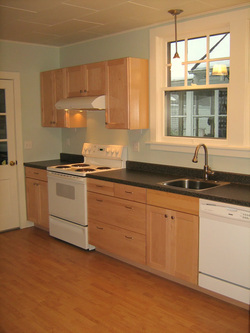 It has been remodeled with hardwood floors, new kitchen with maple cabinets, dishwasher, lighting, and more. It is a very bright house with many windows so winter sunlight fills the living room and kitchen (at least when the sun graces us with its presence). 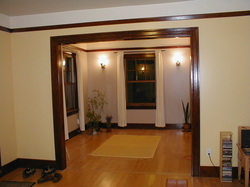 The large open living room spans the front of the house and can be used as one or two separate spaces. Walk-in closets. In the back of the house, there is a bedroom plus an additional room for an office or TV room, etc. Total of 850 sq.ft. Additionally there is a full, unfinished basement with front load Washer, Dryer, and utility sink. The basement is partially painted for workshop/studio space, or just storage. A great house for gardeners with raised beds and mature fruit trees. Cats acceptable with additional deposit. No dogs please. This is a no smoking house. For more info call Bernhard at 503-929-8583. 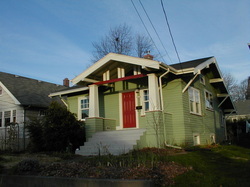 Located at 4204 SE 25TH Ave. The house is centrally located within 1 mile of New Seasons, People’s Food Coop, Trader Joe’s, or Safeway, and two blocks from Tri-met bus stops. It’s less than 4 miles to downtown Portland.